Just as some arguments need to be ended forever, some relationships are too toxic to keep up. You know the type: the overly needy friend who's never there for you when you need him, the person you're dating who's kind of controlling, the ex you keep going back to even though she doesn't love you and always makes you feel like crap. Everyone has been in these kinds of relationships, and rarely do they improve over time: The longer you stay in a toxic relationship, the more likely it is to escalate and mess with your life. You've got too much to do, and there are too many amazing people in the world to waste your time with drama. Cut 'em off, and breathe a little easier. How to go about severing a toxic relationship depends entirely on the situation and the relationship itself. If you're still in close contact and feel that the person will respond maturely to a straightforward rejection, gently deliver the news that it's over. If you've already attempted this approach and the person hasn't responded well and is still imposing on your life, make a real effort to ignore his or her phone calls, texts, Facebook posts, and emails, and maintain that same indifference when it comes to any face-to-face advances as well. The person should eventually get the hint that you're not interested in a friendship anymore. This approach requires an enormous exercise of will. You'll have to stand your ground to avoid sending mixed signals. If you feel like engaging, call or write to a good friend instead. Or, go for a run. Anything else. If these approaches don't work, and you're beginning to sense that you're in danger from a former friend, consult campus police. The situation may not get to that point, and all you'll need to do is give the relationship some distance, but it's good to be aware of potential danger, just in case. Just a bad friend, or an abusive friend? * The person constantly keeps tabs on you. * You feel like you're losing your mind over the relationship. * The person makes you feel like everything is your fault, or turns all his or her questionable deeds around on you. * You're constantly bending over backward to please the person while devaluing your own thoughts and beliefs. * There are insane ups and downs, from explosive verbal abuse to pleading apologies. If you've been the victim of abuse, visit your school's psychological services department for help, or go to the National Domestic Violence Hotline at hotline.org, which addresses many forms of abuse and offers professional, confidential guidance by phone. The social section includes lighter stuff, too, like hosting movie or karaoke night and pranking your friends. Just so you have better context there. The section on "Body and Health" includes the suggestion that you get a medical physical, give your eyes a computer break, and learn to pick out produce, among other suggestions. The "Spoil Yourself" category includes things like getting a massage or facial, having your own all-day TV marathon, and napping, and the final section is a bit forward-looking, talking about things like social media presence, getting a resumé together, getting an internship, networking, and more. The final tip (#77 - not a spoiler, since it's part of the title), gives the Oprah-like advice to "go with your gut." That is probably not a coincidence, since Hayley Bondy's day job is senior editor at Oprah's website, Oxygen.com. In a sidebar entitled "The myth of total, complete happiness", Bondy points out that nobody can be totally happy all the time, and that there's no one way to achieve happiness. "The truth is that there are millions of ways to live your life, and all of them will be difficult at times. We can only do the best we can, so what's the point of listening to anything but your gut?" There are a couple pages of resources at the back of the book relating to various points throughout the book. 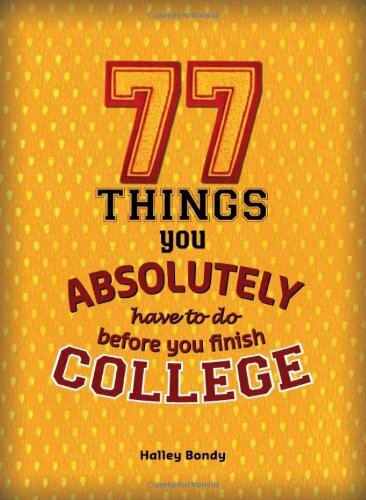 And while students may not be interested in all 77 things in the book, there's enough here to not only get them thinking, but to get them started. A great grad gift, or gift for teens already in college.